Product prices and availability are accurate as of 2019-04-07 07:25:53 EDT and are subject to change. Any price and availability information displayed on http://www.amazon.com/ at the time of purchase will apply to the purchase of this product. 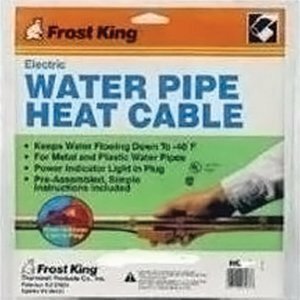 Electric heat cable kit. Built-in thermostat that automatically helps keep your water pipes from freezing down to -38 degrees F. Prevents costly pipe damage. Perfect for unheated or poorly insulated areas.